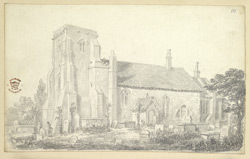 This pencil drawing depicts St Mary Magdalene church in East Ham. The church of St Mary Magdalene remains in superb condition despite its age. It is London's oldest Norman church, built near the site of a Roman cemetery. The interior possesses a rare wall painting, which was hidden under plaster for over four centuries. The large churchyard is now maintained as a nature reserve.